These pants may not be the most flattering. Some may even think they’re crazy. But more importantly, I’ve deemed them the Happy Pants, because they’re bright, colorful, and slouchy-comfy-coziness makes me smile. With styling, sometimes I think people get really hung up over what is the most figure-flattering. I think I get caught in that trap too – but let’s be real, sometimes I want to wear something that feels good, not looks good. Not to say I don’t look good, or that I do; I think this is a fun outfit. I can chase my dog around the park and not worry about breaking an ankle. But it’s not traditionally what one may call chic, fashion-forward, or ground breaking. And that’s okay. Some days this is what I need. Now they’re my pants, my happy pants, and they’re fun and funky and you know what was funny? People were smiling at me when I was wearing these yesterday. I’m sure you’ve heard of the Seattle freeze? Apparently we’re famous for being “frozen” in this state… I think it is someone’s nice way of saying aloof or even rude. I don’t believe it, but regardless, I was getting smiled at yesterday, and I’d like to think it was because of these pants. Do you have any clothing that you just love because it makes you happy? I’d love to hear about it! i kinda dig them! i dont think they are unflattering or anything. they are really cute and definitely happy! So fun! 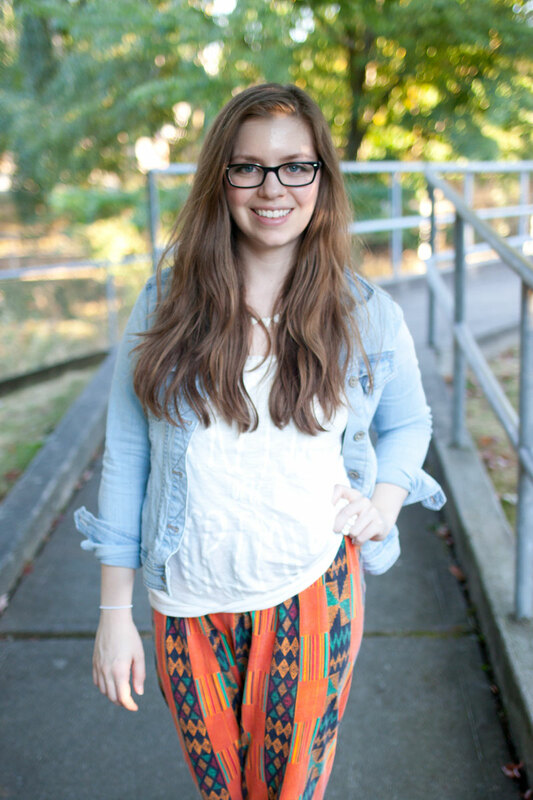 My former roommate has 3 pairs of pants with prints like this and she loves them. 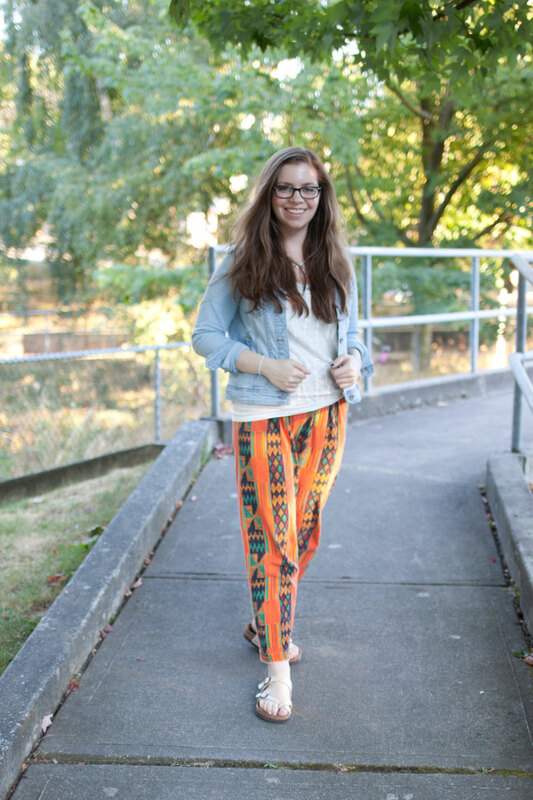 Everybody needs a pair of happy pants! I’d smile too if I saw someone wearing those pants. I like the pants!! They seem comfy and I agree that they are colorful, happy pants! If I could pull those off I’d soo wear them! I’m sure you could pull them off too Olivia! To be honest I had no idea if I was really pulling it off, but it’s fun to try new things! 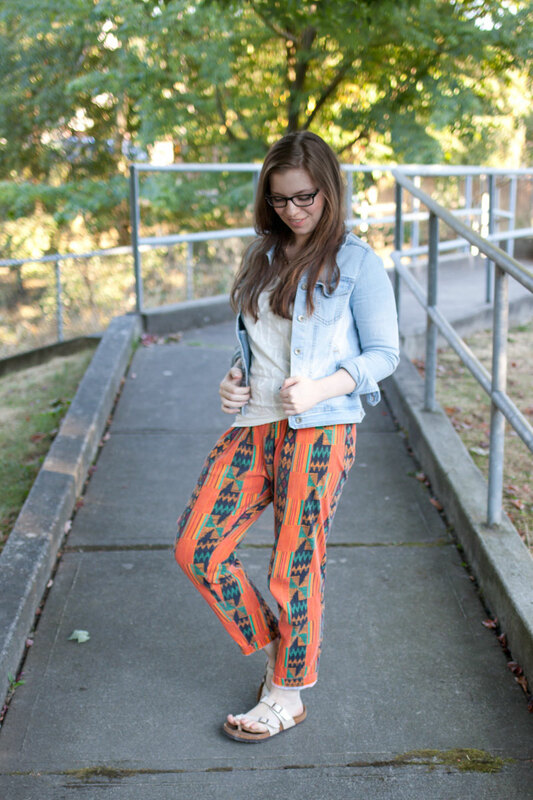 love the printed pants on you, belle! I am literally so obsessed with this outfit I can barely formulate words. Totally agree with you Mica! Comfort is definitely important! Thanks Dana! They’re definitely funky + comfy! There really is nothing better than being in total and complete comfort!!!! I feel that way in my leggings.